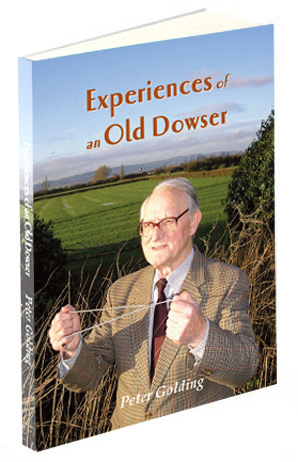 Experiences of an Old Dowser is a long awaited memoir of respected water dowser and diviner, Peter Golding. Peter explores the mystery of dowsing in its many forms from water divining to remote healing. He shares his fascinating experiences, but most importantly, he shares the techniques he has learned and honed over 34 years. If you want to be inspired, encouraged and affirmed in your beliefs as as a dowser, this is the book for you. Necessity is the mother of invention, and as Chief Engineer on a Saudi airbase, Peter Golding often had to locate underground cables beneath the shifting sands of the desert. So began a highly successful thirty-four year career that encompassed all the activities of a jobbing dowser: identifying plentiful supplies of water and locations for boreholes; finding leaks in lakes; map dowsing; finding lost objects; detailed archaeological work (subsequently confirmed by geophysical testing equipment and old photographs); and later on, health and healing. And it all started with two lengths of bent wire! Peter is a remarkable water diviner, past Vice-Chair of the British Society of Dowsers’ Water Divining Group, and author of their Professional Water Dowsing curriculum. He is also a skilled healer, by both person-to person and remote healing as far afield as Australia. This book will help you refine your dowsing skills – especially water dowsing – and contains a detailed guide to Peter’s healing technique. Price £7.95 plus P&P. When ordering by post, please make cheques payable to 'Peter Golding' and sent to Peter Golding, Moorend Lane, Slimbridge, Gloucester, GL2 7DG. Add 'Dowsing for Water - The Complete Practical Guide' to your order and get both for the reduced price of £34.90 plus P&P. Contact Peter for this offer.